No one knows for sure exactly when the dog was domesticated or from what animal man’s best friend came. 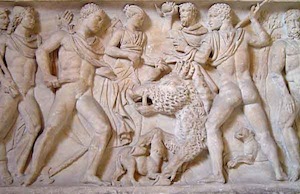 Most say the wolf was the precursor of the dog, but dogs were known for thousands of years in areas foreign to wolves. Ancient man must have watched in wonder as dog-like animals ran after and brought down animals many times their size and he must have thought, Get one of those animals and train him to take down the food we need. 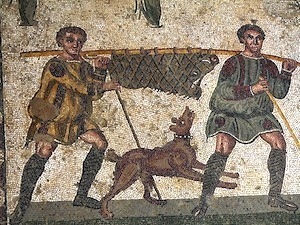 Dogs as hunters or helpers in the hunt were man’s first use of this canine. 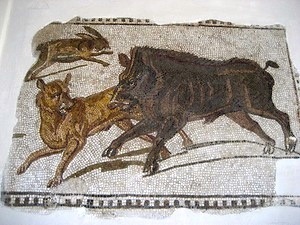 In Greek and Roman times the wild boar was the most sought after source of hunting games and meat. 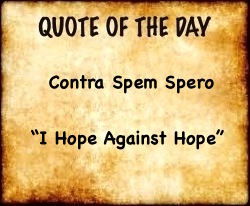 Most heroes in Greek myths and legends kill a wild boar sometime in their lives: e.g. Hercules, Odysseus. The boar symbolized warrior virtues of fearless recklessness and to hunt and kill one was to be valiant and manly. Dogs were equally fearless and their barking, speed and fangs could corner a boar. 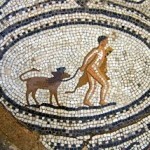 The ancient Romans have left behind many more mosaic representations of hunting than did the Greeks. So ended Meleagros’ lustful desires for Atalanta. But she had drawn the first blood. 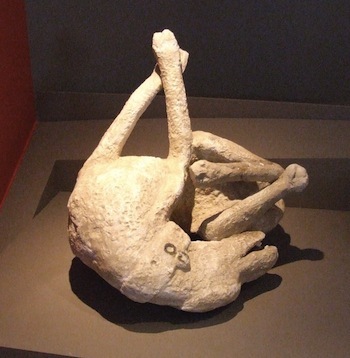 The Greek historian Xenophon (430-354 BC) wrote a treatise on hunting hounds. 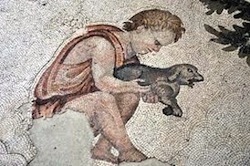 His favorite dog was named Horme meaning “eager,” a two syllable word because Xenophon believed all dogs should only have one or two syllable names. 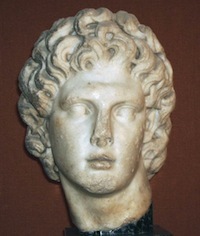 Alexander the Great (356-323 BC) loved his dog named Peritas (three syllable name). He walked him from Greece to the Indus Valley and Peritas never failed him. 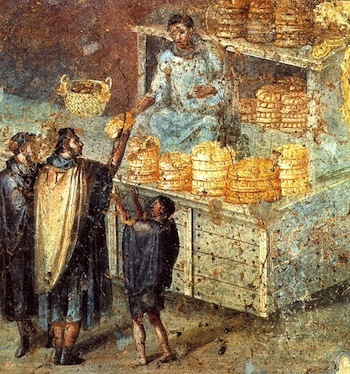 According to Plutarch (45-120 AD) in his Parallel Lives: Life Of Alexander 6: “It is said when he lost a dog named Peritas, which had been reared by him and was loved by him, he founded a city and gave it the dog’s name.” The city was somewhere in India, perhaps not far from the town named after his dead horse Bucephalus. Both cities were the spoils of war for Alexander after he had defeated King Porus at the Battle of the Hydaspes in 326 BC and annexed King Porus’ Punjab area to his Greek Empire which by the time Alexander died at 33 (June 323 BC at Babylon) was an Empire that stretched across three continents and covered two million square miles. We still post “Beware Of Dog” signs on our homes if we have unpredictable dogs. 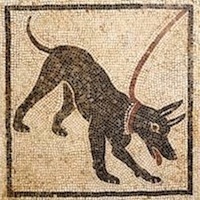 This mosaic of their Fido (Xenophon would approve–two syllables only) in the city of Pompeii at the House of the Tragic Poet has the words directly under their dog. Perhaps it was a slab outside the house. Were I alive before Pompeii was buried in ash in 79 AD, I would have not entered that house as long as that spotted dog was there–even though I LOVE poetry, I would fear a tragic, unpoetic, end! Look at him! 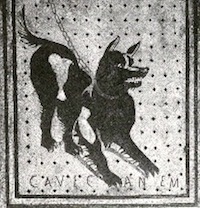 “Cave Canem,” indeed. 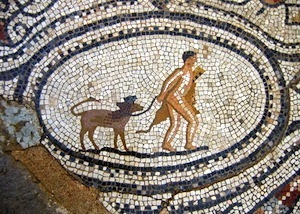 If you had a dog 2,000 years ago and if you were a Roman, Tunisian or Christian, you would have to walk your dog so he/she could do their “business” (strange word to describe micturating and egesting). And if you had a dog on that Pompeian August morning in 79 AD and if you hadn’t heeded the constant belchings that Mt. 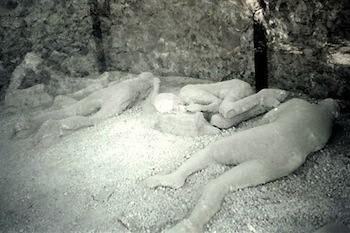 Vesuvius had been making for weeks and you were still there when the old man blew his stack and sent lava racing 18 miles per hour down the lush slopes, you would be dead and your dog would be dead and the other 20,000 people who lived in your town would be dead. 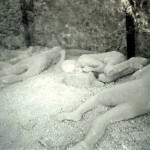 But you and your dog would have a certain type of immortality, for archaeologists have uncovered many of you and your many pets, including dogs, who were perfectly entombed in lava. A soldier’s golden retriever welcomes him home.